Major new unconventional modern poetic epic of Faeries, Unicorns, Wicked Witches, Goblin, Elf and of course Magick ! The nicely illustrated 'The Storie Of Faerie Glade' appeals to both adult and child equally, and you can buy it here as a £5.00 special edition paperback or as a £3.00 Ebook with Search and Zoom ! (and you can print it, see below) Children love Nursery Rhymes and generally do like to read rhyme like 'The Storie of Faerie Glade'. Stars pinpricked upon it, shining bright, up high. An unconventional modern poetic epic work including Faeries, Unicorns, Wicked Witches and the eternal battle between Good and Evil. 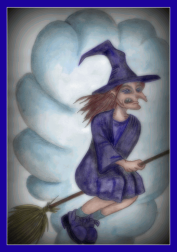 ALSO now available as a sequel to The Storie Of Faerie Glade is our newest pdf Ebook 'Double Trouble'. OR you can buy this in Kindle, Palm, Epub and other formats from Smashwords at - 'Double Trouble'. Andrew John Weaver. Born in Reading, England, in 1958 the eldest of five children and attended Walsall Blue Coat School. A fibreglass engineer, writer and poet. Loves :- Chess, walking, swimming, nature, the outdoors, art, music, poetry, environmental problems and hopefully solutions. Sonja-Marié Peacock. Born in Sasolburg, South Africa in 1963 of an Afrikaans speaking family and attended Middelburg High School. An artist concentrating on scenic art painting and sculpture and also a writer and poet. Loves :- Nature, the outdoors, metaphysics, art, writing, poetry, ballet, music, photography, the underpriviledged and charity. 'dreamweaver - the poems' and an 'A Viking Epic' series. 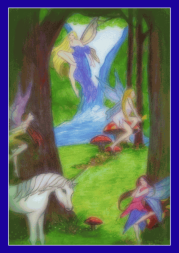 The Storie of Faerie Glade ebook at £3.00, or read a free extract taster !! 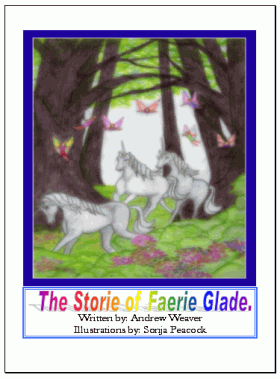 OR you can buy this in Kindle, Palm, Epub and other formats from Smashwords at - 'The Storie Of Faerie Glade'. ON PRINTING YOUR Wilmots EBOOK. NOTE : Some other Wilmots books by Andrew Weaver and Sonja Peackock include 'dreamweaver - the poems' and an 'A Viking Epic' series.